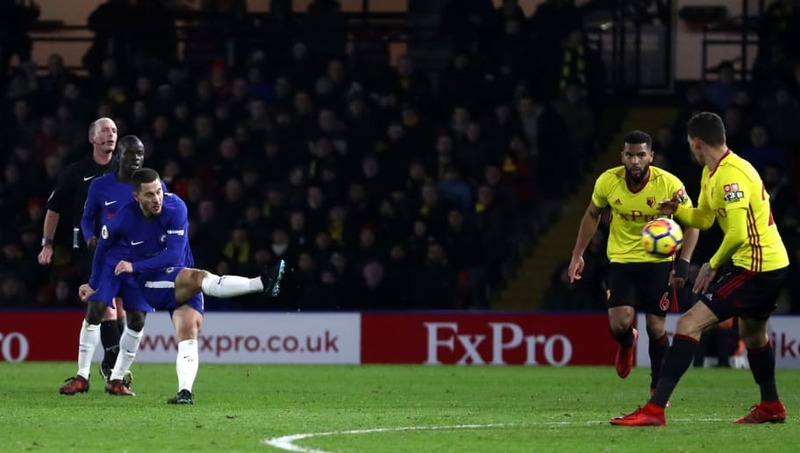 Eden Hazard’s brace to help secure a 2-1 win against Watford on Boxing Day proved to be a landmark moment for the forward, who scored his 100th and 101st goals for the club since arriving from LOSC Lille in 2012. The 27-year-old, who become the tenth player to score 100 goals for the club, is undoubtedly a legend at Stamford Bridge after already winning two Premier League titles, an FA Cup, League Cup and a Europa League. However, he’s also well-known for a number of stunning strikes in the Chelsea colours. Starting off with a goal that’s becoming something of the norm for Hazard, the Belgian capped a fine team move with a piece of individual flair to net his second of the game against Everton in November 2016. 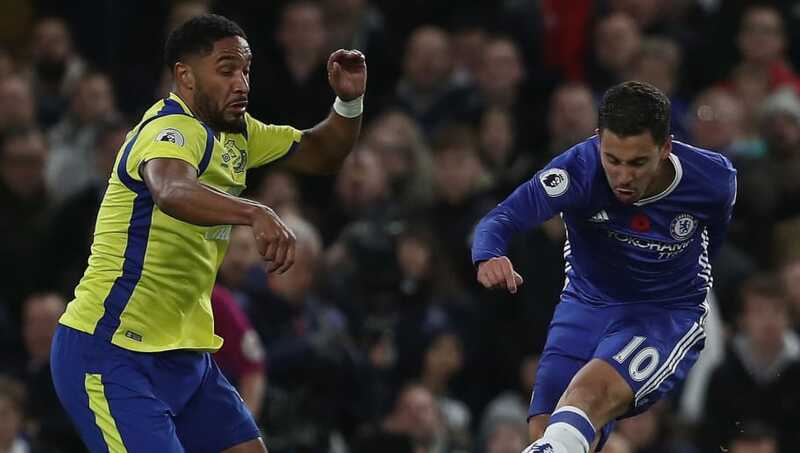 23 passes had been completed by the time the ball fell to Hazard, who skipped past Ramiro Funes Mori with relative ease as he drove into the box, before cutting inside a laboured Ashley Williams and leaving Maarten Stekelenburg motionless. He arrowed his effort inside the near post to make it 4-0 after just 56 minutes, in a game that ended with Chelsea scoring five. It’s not just weaving solo goals that Hazard is capable of, as his long-range stunner against Stoke City proved in fine style. After finding himself in a central position and seeing there was little else on, the winger decided to shoot from all of 30 yards out, with his strike flashing past the diving frame of Asmir Begovic to round off a 4-0 win for the Blues. He proved there that he was capable of performing on a cold night in Stoke. 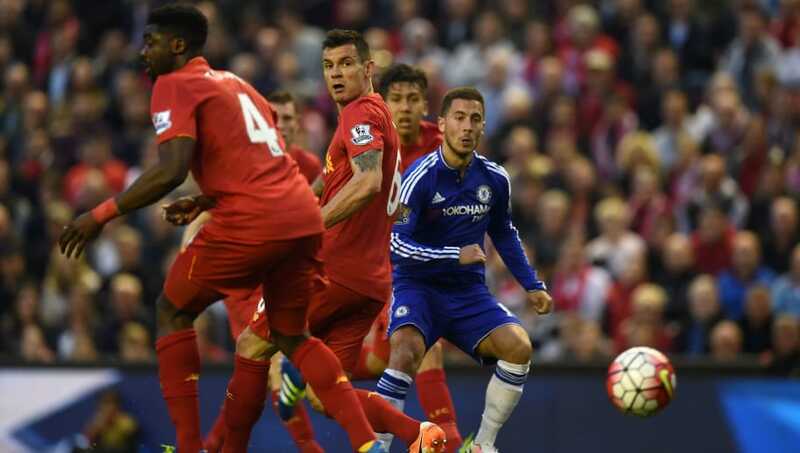 Another type of goal well within the means of Hazard is the first-time finish, with the Belgian displaying that skill to full effect against Liverpool towards the back end of 2013. After Oscar’s pass was blocked by Mamadou Sakho, the ball inadvertently fell into the path of the winger – and without any hesitation – he shaped a cracking finish into Simon Mignolet’s top corner, leaving his compatriot no chance as he drew the Blues level. Samuel Eto’o’s strike secured the win for Jose Mourinho’s side. The 2015/16 season was one to forget for Hazard, who scored only four goals in the Premier League with his first not coming until April in that season. Yet this strike at Anfield was certainly one to savour. Starting from his customary left-wing position, the Belgian rode the challenge of Adam Lallana, slalomed his way past both Roberto Firmino and James Milner, before curling his effort round Dejan Lovren and beyond the reach of Mignolet to add some quality to an otherwise uninspiring dead rubber. Chelsea were 2-0 down in the FA Cup quarter-final against Manchester United at Old Trafford by the time Hazard was introduced to rescue the game for the Blues, and rescue it he did. With just over an hour to play, the ball found its way to the Belgian on the left hand side of United’s area, and with only one thought in his mind, he fronted Rafael up, before bending the ball round the Brazilian and past a helpless David de Gea to halve the deficit. His goal proved crucial, as the Blues forced a replay at Stamford Bridge, which they won courtesy of Demba Ba’s winner. After winning the Premier League in the prior season, Chelsea could only muster a fifth placed finish in the 2017/18 campaign, yet it didn’t stop Hazard from producing moments of magic. The Blues were a goal and a man down against Watford when the winger’s individual brilliance drew them level in the 82nd minute, as the impudent flick took him away from Adrian Mariappa, before Hazard went past the Hornets defender again and curled his effort beyond Orestis Karnezis. While the goal ultimately proved insignificant, with Chelsea losing the game 4-1, it was yet another reminder of the brilliance that Hazard possesses. An early indicator for the talent Hazard had came during his debut season for the club against Sparta Prague in the Europa League, after Chelsea had been eliminated from the Champions League at the group stage. With their last-32 tie heading for extra-time, Hazard picked up the ball on the left wing and drove towards Sparta’s goal in what was the second minute of injury time. After selling two defenders with a dummy, the Belgian lashed his shot in at near post to send Stamford Bridge into hysterics, and Chelsea into the last 16. Hazard unfortunately missed Chelsea’s Europa League triumph as injury ruled him out of the final, although he certainly had a hand in their route to European glory. Another goal now from Hazard’s infamous 2015/16 campaign, with this one against Tottenham living in memory for all sorts of reasons. The goal itself was pretty special, with the forward beating Erik Lamela, Kyle Walker and Eric Dier to find Diego Costa midway into Spurs’ half, before the Spaniard’s return pass was emphatically finished by the Belgian, curling his effort past Hugo Lloris. More significantly however was the importance of the goal, as Hazard’s strike made it 2-2 at Stamford Bridge, ultimately resulting in Leicester City becoming Premier League champions at the expense of their London rivals, who needed a win to keep the title race alive. 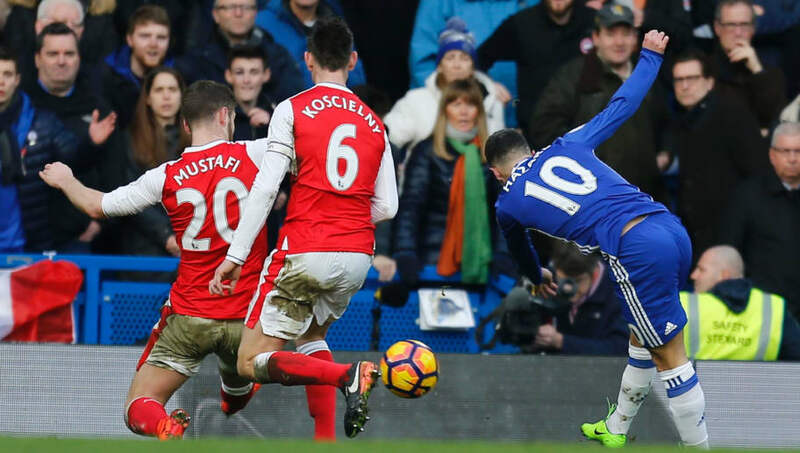 Usually a strike worthy of topping such a list, Hazard’s effort against London rivals Arsenal in 2017 has to settle for second place. Finding the ball on the halfway line, the diminutive Belgian evaded Laurent Koscielny, before comically shrugging off the challenge of Francis Coquelin as he approached the Gunners’ penalty area. Hazard then found a way past Koscielny once again to fire past a helpless Petr Cech and cap a wonderful individual goal. His effort helped the Blues to a 3-1 victory on the day, ultimately resulting in the Premier League title come May. On a list of special strike from the Belgium international, his winner in a recent EFL Cup tie against Liverpool tops the list, and encapsulates the quality of Hazard. With the game heading into extra-time, Hazard found himself on the ball midway into the Reds’ half and showed some nice touches to get away from Jordan Henderson and Fabinho, as he laid the ball off to Cesar Azpilicueta with a pass through the legs of Roberto Firmino. After receiving the ball back off the Spaniard, he then injected some life into the attack, and in some fashion, by holding off the challenge of Naby Keita and turning Alberto Moreno inside out in a matter of seconds. 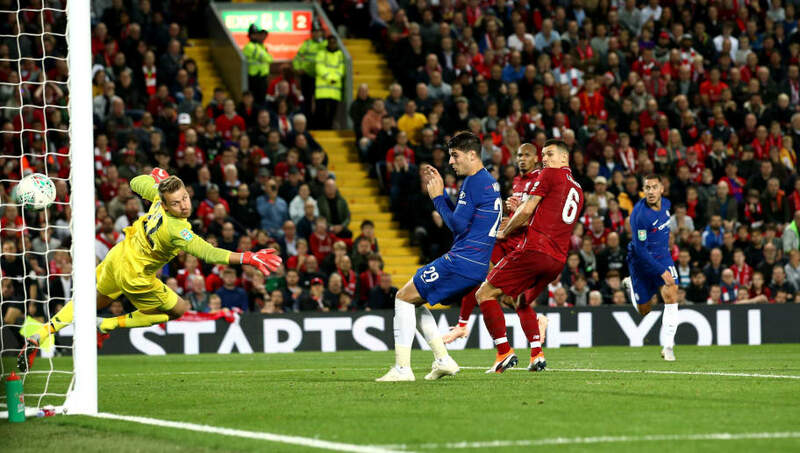 He then rifled his shot past compatriot Mignolet – who must be sick of the sight of Hazard in a blue shirt – to decide the tie with five minutes remaining.